Thanks AC for the links. 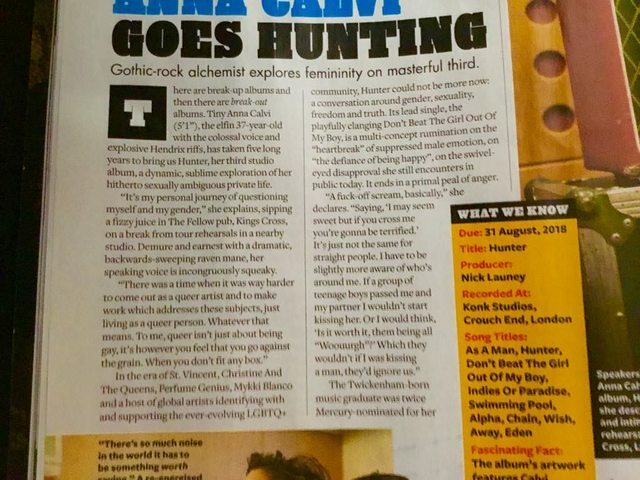 I checked MOJO and can see nothing about Anna Calvi, so not sure what the Tweet was about..
Anna will be playing, conversing and signing at London's Rough Trade East on the 5th of September. Entry with purchase of album. The singer-songwriter and guitarist takes us through the tracks she listens to before a live show. I'd like to read the full interview. Anyone? 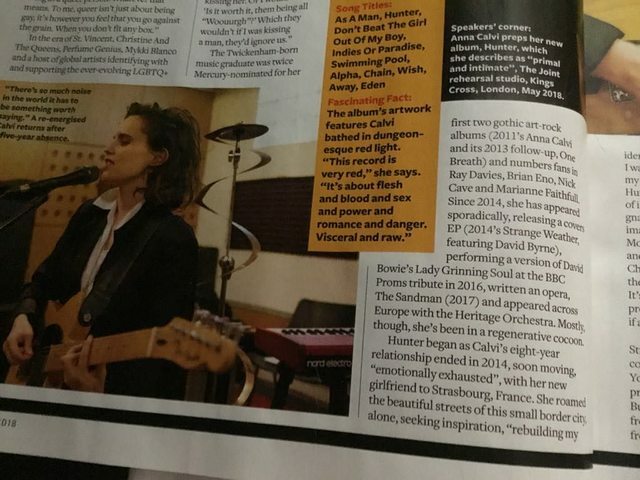 Five years after the 37-year-old British singer-songwriter’s second album of noirish art rock earned her a second successive Mercury Prize nomination, Anna Calvi is back with a third album. Fierce and sensual, timely in its grappling with gender stereotypes and female visibility, it is her most striking work to date. She called it Hunter, she tells me, because “I like the idea of a woman going into the world and just taking what she wants”. The evening before we meet, Calvi is onstage in the West End nightclub Heaven, dressed in a black designer suit, wielding a red Stratocaster guitar, goading and provoking the audience. She sinks to her knees as she plays, then on to her back, abandoning herself to the strange sounds erupting from her instrument. During a virtuoso rendition of gender-bending anthem Don’t Beat the Girl Out of My Boy, she releases an operatic wail that convulses her whole body. It is the mesmerising, powerful performance of a woman in her rock’n’roll element. Calvi talks quietly but passionately, in long, carefully articulated sentences. She says that the period since her last album – One Breath, in 2013 – involved a lengthy process of self-examination. “So much of our gender is performed, I feel, it’s very limiting for both sexes,” she says. “As a woman, you’re made to feel your appearance is what you are. It’s what you look like [that counts] and not what you do. Calvi was born in Twickenham, to an English mother and Italian father, both of whom are therapists. Her first instrument was violin, and she graduated in 2003 from the University of Southampton with a degree in music. Her inner rocker, though, had been unleashed years earlier when, at the age of eight, she saw footage of Jimi Hendrix at Woodstock, giving a performance that just “looked and sounded like freedom”. She also cites the Belgian-born jazz composer Django Reinhardt – “who taught me about arpeggios” – and West African music, “which taught me about sweet picking”. Calvi’s best songs strike an unusual balance between opposing qualities, plucking something life-affirming out of cynicism, nihilism and fatalism. Those opposites are also evident in Calvi herself; so quiet and intense offstage, so wild and free onstage. “Maybe this is a bit fatalistic but I always think ‘if this is the last thing I ever do, the last record I ever make, the last performance I ever play, how do I want to go out? How do I want to leave it?’” she says. 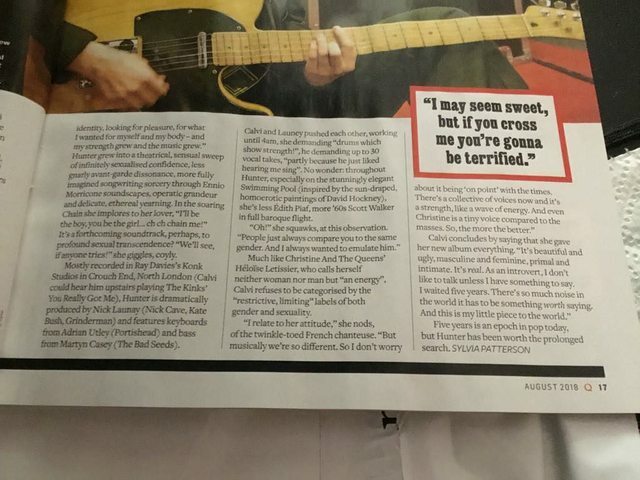 “There is a bit in Don’t Beat the Girl Out of My Boy that I have to sing very high and very loud and I can’t do that without completely surrendering myself, where there is absolutely no space left to think or be anything other than that note. Nineteen British music acts have been awarded funding from the Department for International Trade (DIT) as part of the Music Export Growth Scheme (MEGS). In the latest round of MEGS funding, the £319,244 will be distributed among artists including Pale Waves, Lucy Spraggan, Anna Calvi, Sharna Bass, Fickle Friends, Nothing But Thieves and Tunng. The scheme is designed to help build international fanbases and boost music sales outside of the UK, as part of the Exporting is Great campaign. You’ve collaborated with a lot of big names including Marianne Faithful and Talking Heads’ David Byrne, who would you most like to collaborate with dead or alive?